Nothing goes together better than Star Wars and whiskey. Actually, as I read that back, I’m realizing a lot of things may go together better than Star Wars and whiskey. In fact, Star Wars movies usually start out with a lot of reading, so you probably want to be pretty sober to handle that. Still, if you’re a Star Wars fanboy who also loves a good tipple, there’s no reason you can’t combine Star Wars and whiskey as proven by the blog by Scotch Trooper. 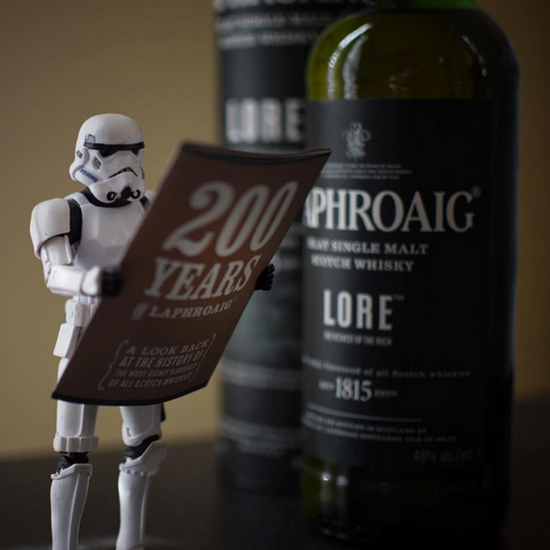 The creator of the blog, which was launched in March, describes it as “the ramblings of a Whiskey-Fueled Stormtrooper” – and indeed, it has plenty of talk about whiskey, but the real star of the show is its corresponding Instagram account featuring beautifully-composed shots of Star Wars action figures posing with fine bottles of Scotch, bourbon and the like. And while Disney’s feelings about seeing their family-friendly franchise intermingling with hard liquor is up in the air, the quality of the photography isn’t up for debate.